The Montana primary featured a competitive race between Rosendale and former judge Russell Fagg. Fagg had an early lead in the polls thanks to strong support in Yellowstone county and surrounding counties, while Rosendale had support from counties all over the state of Montana. At 12:04 a.m. ET Wednesday, Rosendale took the lead over Fagg in the polls, leading to cheers and applause from the Rosendale headquarters. The Montana Republican’s victory on Tuesday night signifies a surging wing of conservative and populist candidates who have won their respective primaries, including West Virginia Attorney General Patrick Morrisey and Mark Harris, who defeated the incumbent Rep. Robert Pittenger (R-NC). Matt Rosendale is the type of fearless defender of liberty I want fighting by my side in the US Senate. We need more lovers of liberty in the Senate. Matt has proven himself a bold defender of our constitutional rights and a champion of limited government. The people of Montana would be well served by sending Matt Rosendale to Washington! Rosendale was the only Senate Republican primary candidate to have U.S. senators endorse him. Sens. Ted Cruz (R-TX) and Mike Lee (R-UT) also endorsed Rosendale for U.S. Senate. 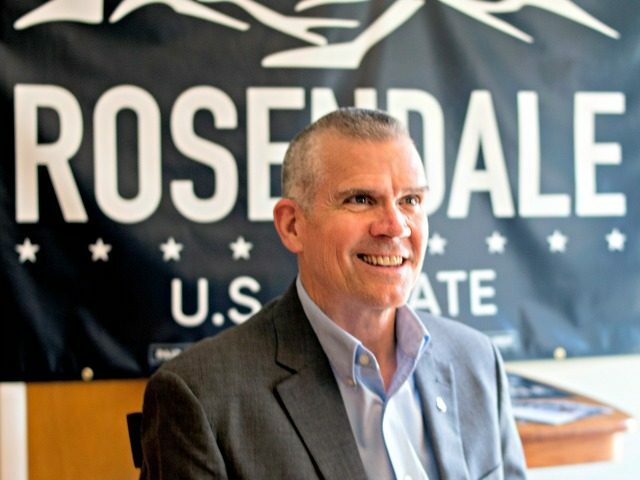 More than 30 Montana-elected officials have also endorsed Rosendale. In an exclusive interview with Breitbart News, Rosendale credited his authenticity as a candidate and aa a politician for why three conservative senators endorsed him. “I think it’s basically because they know that they know that I serve the way that I campaign,” Rosendale said. Fagg resorted to negative campaign ads in the last few weeks of the Montana GOP primary to make up for the significant gap between him and Rosendale. Rosendale told Breitbart News that Fagg resorted to negative attacks out of desperation. Matt Rosendale led by roughly double digits in the Montana Senate Republican primary, according to recent polls. During a rally in Nashville, Tennessee, President Donald J. Trump labeled Sen. Joe Manchin (D-WV) a “tool” of Senate Minority Leader Chuck Schumer (D-NY). Rosendale contended that Tester serves as a similar supporter of Schumer.